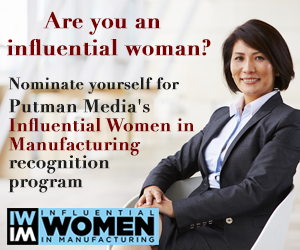 Putman Media and Plant Services are proud to launch Influential Women in Manufacturing, a program focused on recognizing and honoring women who are making a difference in the manufacturing space. Is 2018 the Year of the Woman? Here at Plant Services, we think so. We are launching Influential Women in Manufacturing, a program focused on recognizing and honoring women who are making a difference in the manufacturing space. Nominate as many influential women as you want, and you can even nominate yourself. If you have any questions in the meantime, please don't hesitate to contact us by email.